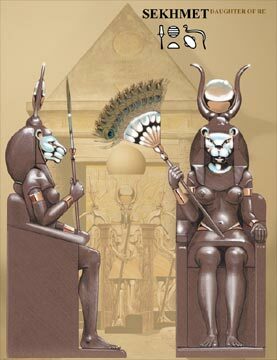 Four black, granite, life-size seated figures of Sekhmet form the outer circle, all looking in towards the centre. The lioness heads are featured in silver while they all wear the moon between two horns fixed to their head-cloth. They all hold a fan representing papyrus also made from silver with a touch of gold and the staff of wood. The colourful peacock feathers have been added replacing the original ones that had perished many years ago.